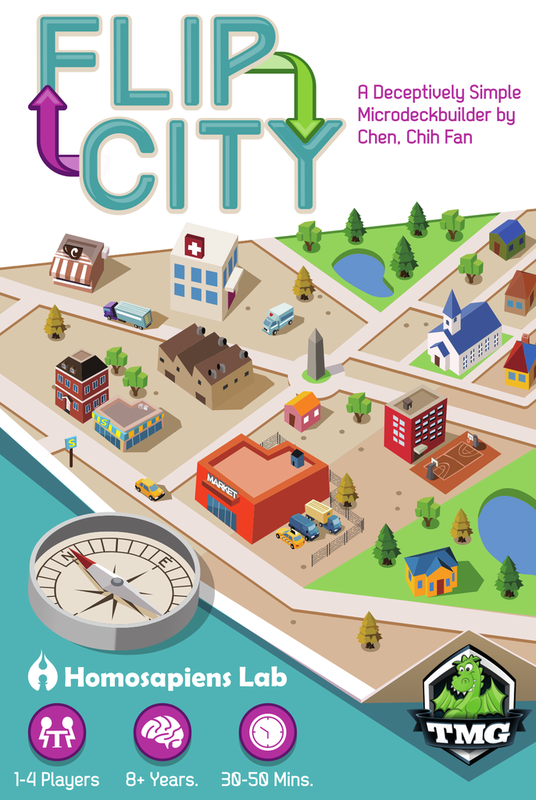 Flip City is a game by Chih-Fan Chen, published by Tasty Minstrel Games. It is for 1-4 players. In this game, players will be tasked with the job of building and improving their own city. However they’ll have to be careful as too much construction will make the citizens of their town very unhappy. In the end the player that can build the best town and score enough points during their turn will be declared the winner. 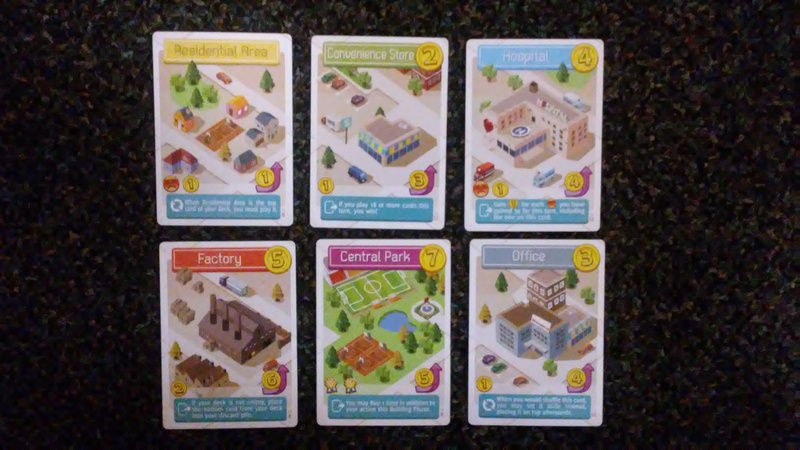 To begin, each player will be given a deck of cards consisting of 4 Residential Areas, a Convenience Store, a Factory, an Apartment, a Hospital and a Central Park. Players shuffle their cards together with these named sides of the cards face up. This forms their starting deck. It should be noted that since these cards are double sided, the player should shuffle their cards beneath the table or in a way that they can’t determine what the top card of their deck is. The general supply decks are then formed and placed in the middle of the play area in separate stacks. These stacks consist of 12 Convenience Stores, 10 Offices, 12 Hospitals, 8 Factories and 8 Central Parks. The cards should be placed with these sides face up in the stack. The Office cards are actually used as an expansion and are optional. Any remaining cards should be returned to the box. The first player is chosen and play now begins. The game is played through a series of turns. Each player will take their turn consisting of two phases; play cards phase and building phase. The first phase is the play cards phase. In this phase, the player will play cards one at a time from the top of their deck onto the table in front of themself. Each time a card is played, the player checks it for any additional rules or effects. Once a card has been played, the player has the option of playing another card from their deck or stopping and moving on to the building phase. Once the player’s deck runs out of cards, they have the option of stopping and moving to the building phase or shuffling their discard pile and creating a new deck. It should be noted that once the deck is shuffled, the player again has the option to stop or play more cards. During the player’s turn, if they receive 3 or more unhappiness from the cards that they played during this phase, the player’s turn ends immediately. Any cards that were played are then placed into the player’s discard pile. It should be noted that during this phase if a player has any cards in their discard pile that have the recycle symbol on them, they’re allowed to use the cards ability to flip it over and gain the effect or resource that it provides. This may be done at any time during this phase. The next phase is the building phase. In this phase, the player is allowed to take 1 of 3 different actions using the cash that they gained from the previous phase. The 3 actions are buy, flip and develop. To buy, the player simply chooses a card from the supply and pays it’s cost. The card is then placed in the player’s discard pile. To flip, the player chooses a card in their discard pile and pays it’s flip fee. The card is then flipped over to the other side and remains in the player’s discard pile. To develop, the player chooses a card in the supply and then pays the card’s cost and it’s flip fee. The card is then placed in their discard pile with it’s back side up. Once a player has completed their action, they check to see if they have satisfied one of the victory conditions. If not, their turn ends and the cards that they played are placed into their discard pile. Play then passes to the next player in turn order. The game continues until either a player gains 8 points during their play cards phase or they satisfy the victory condition of the Convenience Store card. If a player fulfills either of these conditions, they win. This game consists of a deck of 86 cards. The artwork on each one is very nice. It has a very cartoonish look and feel to each building. It kind of makes me think of an older version of the SimCity computer game or the card game Machi Koro. I like the design and how there’s plenty of artwork without the text of the card getting in the way. Each of these has a satin like finish to them and is very good quality. I like how easy they shuffle without sticking together. They’re just the right thickness and look great on the table. The iconography isn’t too overwhelming and with a couple of times playing the game, it’s easy to remember what each icon does. Overall I like the look and feel of the cards. They’re very good. The rulebook for this game is a huge double sided paper that folds up small enough to fit inside the box. It’s a little bit thicker than normal paper and has a nice finish to it. There are lots of pictures on both sides of the paper. There’s a great overview of the components with pictures, as well as how each player’s deck should be set up and also how the general supply should look. The back side of the paper actually goes through the different phases of the game and also includes a breakdown of a card. It also explains all the different icons on the cards. I will say though that I kind of wish there had been a reference card with all the card icons on it or a way of being able to reference those icons a little better. It would have helped out in the first couple of games. The rules also have a section devoted to frequently asked questions for a little bit of clarity. The rules also include a solo variant for playing by yourself. I really like that this was included as I do like to play games solo from time to time. Overall I think the rules do a fairly good job of explaining everything. For the most part I’m pleased with the overall look and feel. This is a fun game that doesn’t take up a ton of room. With it only being a couple stacks of cards, it’s fairly easy to take with you and play almost anywhere. It’s not a secret that I like deck building games. This one refers to itself as a microdeckbuilder. Not sure what that is, but if it means that it only has a small amount of cards to play with, then I get it. I have to say that I like the idea of flipping the cards to get better buildings to be able to do better stuff with. I like that there are plenty of choices to make such as when to stop playing cards from your deck. It’s a bit more than just I create this many points so I can now fight this card or buy this card. I also like that there’s a negative aspect of the game in the unhappiness of the city residents. If you get too much of that, you’re turn’s over and you discard all that you’ve played. It kind of gives you a push your luck feel in that way. It’s not a difficult game but the icons can take a bit of getting used to, at least for the first few times you play it. It’s definitely a unique take on deck building that I wasn’t sure if I would like or not. However I actually like it. I especially like playing it solo. Solo is more about making sure that the supply doesn’t run out before you’re able to fulfill one of the victory conditions. The thing is that each time you shuffle your deck you have to remove a card from the supply. This not only limits what you can buy but it also puts a timer on the game. This is a great little challenge and it scratches my deck building itch as well as my city building itch. I like it just fine with others but solo is my favorite way to play this. Overall fans of deck building games or card games like Machi Koro might enjoy this one. It’s a great game that is fun for the whole family or for just playing by yourself. I would recommend it. Flip City is a microdeckbuilding card game that can be played with the whole family or enjoyed solo. It’s a fairly fast game. Most game sessions last around 35-40 minutes. Solo play is usually a bit faster. The artwork is really fun and light. It makes me think of Machi Koro or the older versions of SimCity on the computer. This is a very unique take on the deck building mechanic that I quite like. It gives plenty of choices without being too complex. The iconography does take a bit of getting used to for the first couple of games. I wish that there had been a reference card to help with this. It’s a fun game to play with others and it’s very portable so that it can be played almost anywhere. However I prefer to play this one solo. It’s a nice challenge without taking up too much time. Plus it scratches my deck building and my city building itches. Overall this is a great card game that I look forward to spending more time with. This is one that I’d recommend, especially for those fans of deck building games or those that enjoy a good solo game. Forget Flip this House, let’s Flip this City! This entry was posted in Reviews and tagged board, board games, card, card games, chen, chih, chih fan, Chih-Fan Chen, city, fan, flip, flip city, games, minstrel, tasty, tasty minstrel games. Bookmark the permalink.